Wow, I love them all Tracey! What a great stash of goodies to play with! Wowwwwwwwww wow wow wow!! These are all absolutely STUNNING!! I am loving the one with the tree the best!!! Tracey what an inspiring post! Each card is so beautiful! And I love the chalkboard tag too! 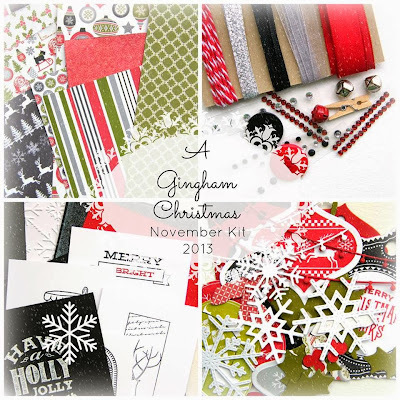 I love how you used the beautiful papers and the new lil inkers die! Gorgeous! Gorgeous! Gorgeous! Tracey! You rocked this kit! I LOVE all of your cards. Hard to choose a fave, they are all amazing! All kinds of amazing cards. I especially love the second one that is based on the CASE this Sketch. The embossing is gorgeous. Beautiful! 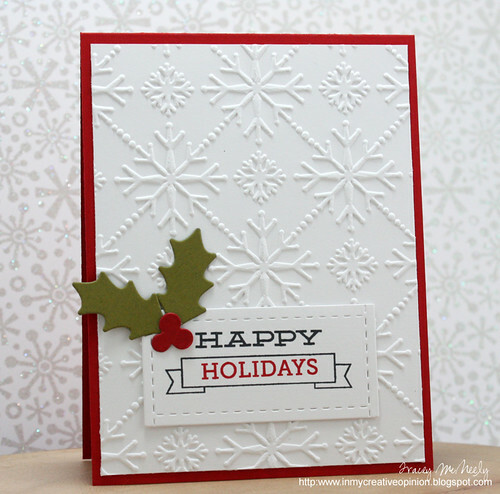 Love the lights on the tree and the CAS embossed snowflake card! All so pretty!! Tracey they're all simply perfect! and why didn't I use mine?!!! Gorgeous cards Tracey! Love the stitched strips of paper ,I wanted to do the same thing with mine but ran out of time ...I love that new die from LID. Love the tree with the lights on it and that wonderful candy cane paper! Love your tag too! Oooooh these are all just fabulous and I think the first is my fave too!! Although your little chalkboard tag gives it a run for its money!! I feel like a total dummy...didn't even think to cut up that little Christmas light garland. What was I thinking? 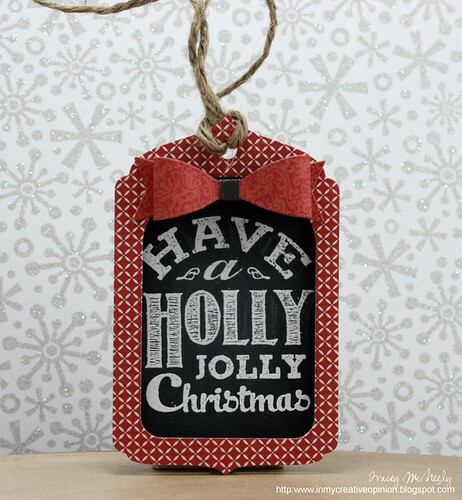 It looks so fabulous decked out on your chalkboard tree! My favorite is the one with the diagonal die from Lil Inker...such a great way to use some of the beautiful patterned papers Kelly sent us! OOOOOH!!! Tracey these are a Christmas feast for the eyes!! Each and every one is just stunning! I'd be hard pressed to tell you which was my favorite! Absolutely gorgeous work my friend!! So many wonderful holiday cards! I love every one! CAS Happy Holidays one. But then they're all so good I hate to pick. Tracey! I came by to see what you created for FMS and...HOLY COW!!! I can't believe you created all these cards and tag with a kit!!! AMAZING!! All of your cards are gorgeous! Although I may be a bit partial to the one for Freshly Made Sketches. ;-) Thanks for joining us this week at Freshly Made Sketches! Your cards are amazing Tracey and you have waiting til the last minute to get them done on your side, using new dies and entering in challenges, so smart of you. Your tag is just too darn cute and I love that you decorated your tree with the lights, I was so stumped on what to do and your totally nailed it. Fabulous, simply fabulous! Wow--so much inspiration here, Tracey! Love all your work! Gorgeous cards, and I love your tag! You've been a really busy girl...I just LOVE everything! Oh Tracey you've created such lovely cards! I just love the gorgeous colours you've used for your Freshly Made Sketches card! Thanks for joining us at FMS this week! Did you make all of these after we chatted? I barely got 3 done and was pooped!!! My favorite is that first one....love how that black tag really stands out against that pattern paper! If I had to choose another....it would be how you used more patterns with the On the Diagonal die! Love this idea!!! I so enjoy our monthly chats as we feverishly work on our projects the night before! :) Happy Holidays Tracey!!!! Tracey, such lovely cards. I think the first one is my favorite too, but I like the second one and the tree on the black is absolutely gorgeous. Beautiful, beautiful, beautiful, Tracey! 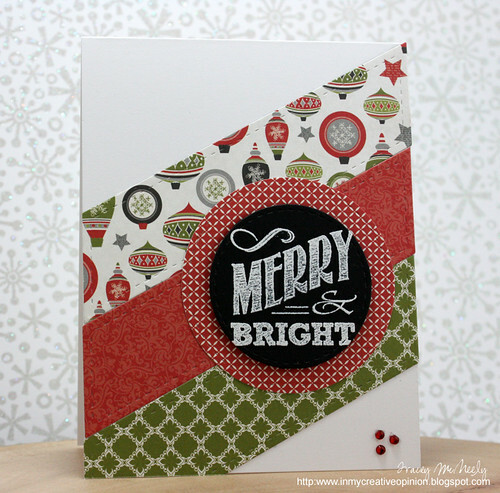 I just love the merry and bright card, it is stunning and I love the way you layered the patterned paper at an angle. 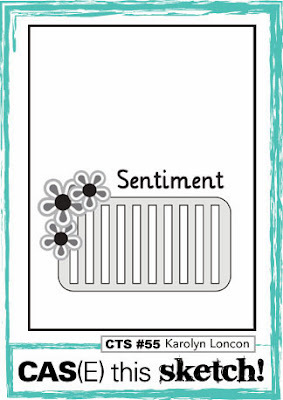 Coming in at a close second in the grey snowflake card, it looks so classic and beautiful! Gosh, Tracey--every one is just perfect! Love how you used the WMS tag with patterned paper--something I wouldn't have thought of and yours looks gorgeous. And I should have used by LI diagonal die--such a fabulous way to showcase the patterns. Your last card is just amazing. LOVE the simplicity of the design and the single snowflake! So much to love in one, little post! LOVE! TFS! Every month you all blow me away with your kit creations. The diecuts are my faves I think. You manage to find such original uses for them every month! 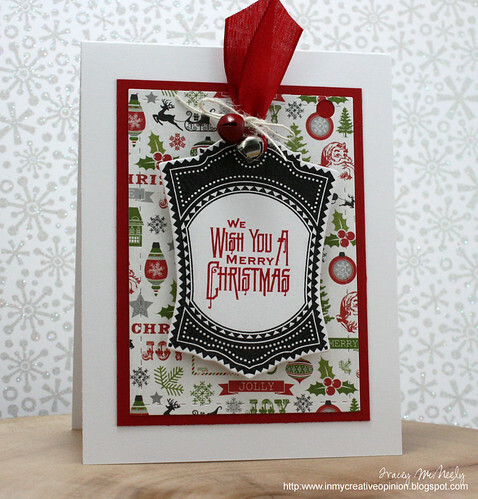 Beautiful cards Tracey...and so much holiday inspiration! soooooo much fabulousness here! I love everyone one of these, especially the chalkboard stuff! You rock girly! Hope to be lucky enough to meet you one day! Good grief. When you get cranking, you are unstoppable. So many fantastic cards and ideas. Now I am wishing I had saved a little something for casing. I'm still not sure how you made that smaller stitched rectangle, but it is a brilliant idea however it works. Holy awesome cards, Batman!!! These are all fantastic! Wow! Thanks so much for playing along with us over at the Simon Says Stamp Wednesday Challenge! Oh, WOW! I love, love, LOVE all your cards/tags with this kit. Seriously love! Beautifully done, as always! It will be hard for me not to just recreate your first card exactly as it is--it's just perfect! I love all of the white with the crisp red frame and holly accent on the second card, and you've rocked the angles on the third one! 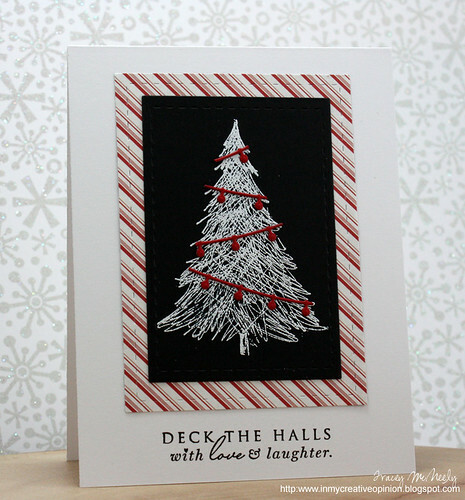 The candy stripes work perfectly behind the chalkboard tree with the simple embellishments, and I'm loving the use of the sketch on your last card. All that and a gorgeous little tag, too! Such an inspiration! Love your take on the sketch, Tracey! The embossed background is so pretty. All your cards are so perfectly done! CONGRATS Awesome to see THREE of my CASology Teamies on the Honor rolls and FAVES at CTS!!! Yeahhhhh!